Art Around Hall County Update with Frank Norton, Jr.
Home / Featured / Art Around Hall County Update with Frank Norton, Jr.
It’s not a coincidence that you are seeing more and more public art around Hall County. 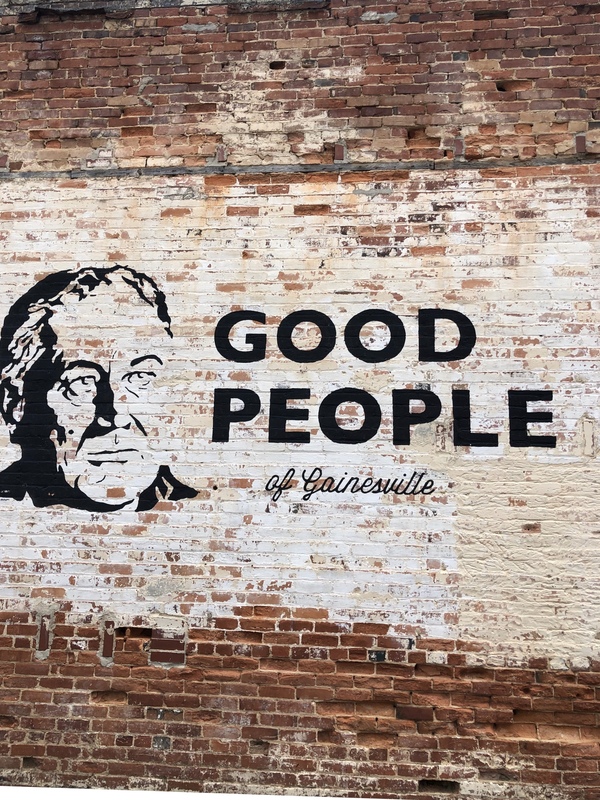 The Vision 2030 Public Art initiative has been encouraging and raising funds for public art for years in the Gainesville-Hall County art districts. “Gainesville-Hall County has several art districts, from Downtown Gainesville, to Lake Lanier, Chicopee Woods and Gillsville/Lula. These art districts are being promoted and planned with help from the many local artists and organizations including Vision 2030 Art,” according to www.2030art.com. The Vision 2030 Art initiatives depend on grants, private donations, community support and corporate donations to conserve, preserve and make available public art to citizens and visitors in Hall County. Leading this initiative is Frank Norton, Jr.; Vision 2030 art chair, artist and CEO of The Norton Agency. First, the duo had to define what public art is. “Public art has to be accessible to the general public. It can be on a variety of medias, it can be two dimensional, or three dimensional. But it has to be accessible, it has to be original, and it has to be unique,” Norton said. “There are a number of things that are public art. There is a bronze medal of President Roosevelt that is in Roosevelt Square, that is a piece of public art. There are a number of original pieces of public art in cemeteries. Those are not necessarily cast, but they are original pieces of public art that are unique and original, headstones. We have begun to incorporate that, but we inventoried 75 pieces of public work. They were primarily concentrated in and around Downtown, Brenau campus, and Memorial Park Gardens, which was an interesting discovery. The B.U.R.D.S (Brenau Urban Rural Discovery Secrets) can be found throughout Hall County. You can spot a BURD on each of the new Gainesville signs heading into the city, buildings on Green Street, the Brenau campus, local businesses and more. If you spot a BURD, take a photo and share on social media with the hashtag #2030BURDS. “The second thing we have just launched is a bike rack program, through the efforts of Paden Dunagan, of Dunagan Welding, who helped produce the birds. We have a bird bike rack, and it is painted with primary colors. We have 50 to start with, and we are just placing our order for the second 50. They are available for purchase at $250 a piece, that’s not installed. They can be grouped in multiples. The largest collection of public art is in the ‘Royal Space,’ which is in between The Collegiate and Hunt Tower in downtown Gainesville. The Free Range Art program are 8 feet by 8 feet, two dimensional works that art placed on the buildings and will be changed out every couple years. Another free range art project will be large painted artworks on buildings. The goal for Vision 2030 Public Art is to have more than 500 pieces of public art in Hall County. Next up, for art lovers interested in supporting Vision 2030 Public Art is the second annual Vision 2030 Block pARTy on May 10 just off the Downtown Gainesville Square. To view the PUBLIC ART throughout Gainesville and Hall County visit www.2030art.com. Vision 2030 also is in need of volunteers, if you are interested in volunteering also visit www.2030art.com.